Although Dan had a bit of a crash 2 weeks ago and potentially broke his arm, this determined young lad has not been deterred as he was back on his bike last weekend! There has been no conclusion to whether his arm is broken or not! He has had 3 specialists look, 2 of which say it is not broken and the other claiming it is, but there has been no definite answer. 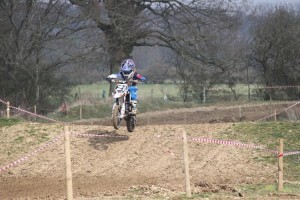 But Dan is a superman, so battle on he will taking on the Ringmer track. Here is his Dad, Matt’s commentary from the weekend. 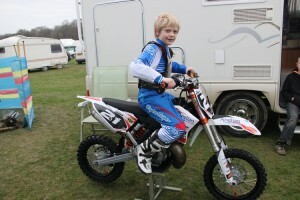 We made a return to racing on Sunday at Ringmer in Sussex after Dan had his plaster removed a few days before following his crash at Lamberhurst 2 weeks earlier. Despite the conditions being far from ideal following heavy rain on the Friday, everyone had to be towed into the paddock on the Saturday by tractor and then towed back out again afterwards making it a late Sunday night journey home and the whole paddock wallowing around in ankle deep mud. Although the conditions were poor, Dan rode within himself claiming a steady 12th in the first race followed by a excellent 8th in the second, and with a very sore arm came home 10th in the last giving him 11th overall on the day, considering the conditions with many riders struggling just to get to the end of the start straight, Dan had a crash free weekend and his Anglian backed KTM didn’t miss a beat. Dan will be out testing this weekend at a new venue Bonneville Farm near Basildon in Essex followed by another race meeting back at Ringmer the following weekend. 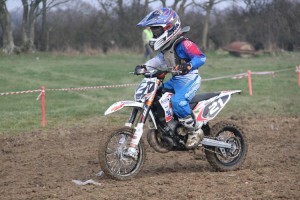 We have a 2 day Easter meeting at the famous Wildtracks venue near Chippenham in Suffolk, not to far from Norwich.